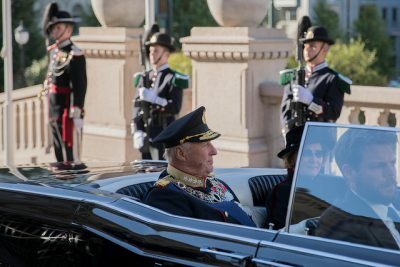 After driving through downtown Oslo in an open car under brilliantly sunny skies, King Harald V opened Norway’s 161st session of Parliament (Stortinget) on Monday with all the pomp and circumstance of decades gone by. 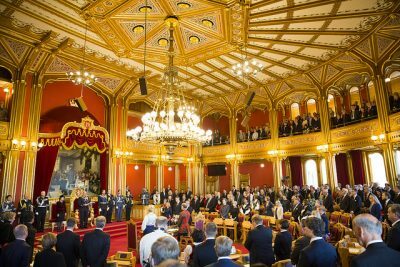 The formal opening is a unique event when elected representatives, government ministers, top bureaucrats, court officials and the royals gather for an official ceremony. The opening ceremony is timed down to the minute with little room for deviation, even when the king stumbled on the steps leading down from the throne that’s only pulled out of storage once a year. 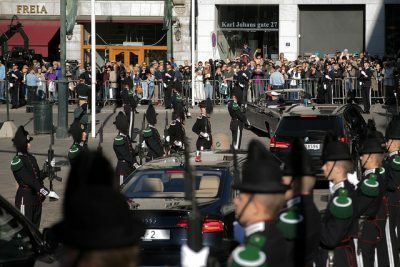 His son Crown Prince Haakon was quick to extend an arm and the procession went on without interruption. It’s the only day of the year when all three branches of state power are assembled in the same room for an official event. 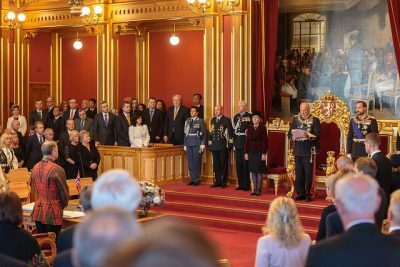 The monarch, the president of the parliament and legislature and the judiciary otherwise rarely meet together, and on opening day they’re accompanied by civil and military leaders, the Royal Court and other invited guests including members of the diplomatic corps. Several ambassadors could be seen eagerly taking photos on their mobile phones before the session began. Everyone is dressed up for the day, with the royals in full uniform and many men and women wearing the formal Norwegian costumes known as the bunad or drakt. Two of the Members of Parliament leading the royal procession into Stortinget on Monday were wearing their samidrakt from Finnmark while the president of the Parliament, Olemic Thommessen, once again donned his bunad. “We have a solid cultural heritage of using our bunads, and I think it’s nice,” Thommessen told state broadcaster NRK when the highly ceremonial opening was over. It included the king reading the trontale (speech from the throne) aloud. It’s prepared by the government and was particularly important this year because it’s the last one before they’re up for re-election next year. 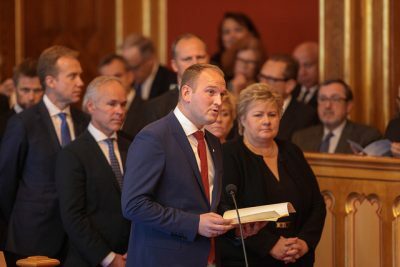 After ministers and MPs sang a Norwegian version of “God save the king” a cappella, the king delivered the speech that outlines the government’s plans and policies for the coming year. Then another speech is traditionally read by the youngest member of the government, who this year was the 32-year-old agriculture minister Jon Georg Dale. It’s akin to the State of the Union in the US, and the government continues to stand during its entire delivery. The president of the parliament also makes some remarks before everyone sings the national anthem a cappella and the royals are escorted out of the ornate room. That sets off a long procession of departing ministers as well, all of whom either bow or curtsy to the parliament’s president on the way out. No debate can be held or the gathering closed until the king has literally left the building. Once outdoors again, the royals are driven back to the Royal Palace and thus miss all the mingling and socializing that occurs after the meeting is adjourned. The royals were, however, met outside by crowds gathered on the streets, which were lined with royal guards and decorated with Norwegian flags. The king waved, and many passersby waved back. Debate on the government’s speeches will extend over the next two days, climaxing with the government’s presentation of the next state budget on Thursday.